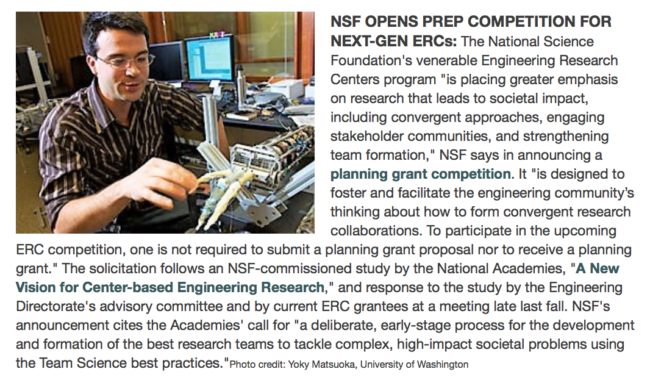 The premier R&D and value creation programs at the U.S. National Science Foundation (NSF) are Engineering Research Centers. These are initiatives where multidisciplinary teams address grand challenge opportunities with $50M of funding over ten years. The centers are formed from leading U.S. universities and commercial partners. The goals of the initiatives are: 1) paradigm-shifting research, 2) training of students in team science and value creation, and 2) societal impact, including through commercialization. A 2017 study by the U.S. National Academy of Engineering (NAE) I was part of made major recommendations for how the centers could be formed and managed to make the biggest societal impact. As shown below, the NSF is now implementing these new practices. I am extremely excited about this because I believe the changes made will have a major impact on the output of the centers and the ability of students to become successful value creators. The management of the NAE and NSF are to be congratulated.